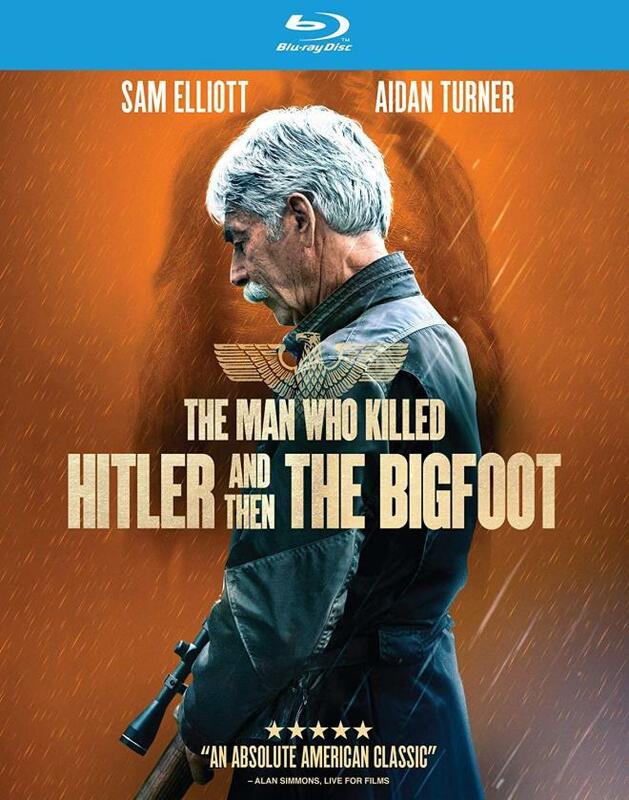 Hot off his Oscar-nomination, Sam Elliott delivers yet another incredibly well acted and heartfelt performance as The Man Who Killed Hitler and Then The Big Foot. No seriously, he's really good in it! The movie itself may leave some dry while others will fully embrace the lunacy of this well-written, directed, acted would-be exploitation flick. RLJE delivers a first-rate Blu-ray with an often stunning image transfer, a great audio mix, and an informative set of bonus features. Recommended. "What I did that day didn't mean a thing… I just killed a man." WWII veteran Calvin Barr (Sam Elliott) spends most of his time alone with his dog. 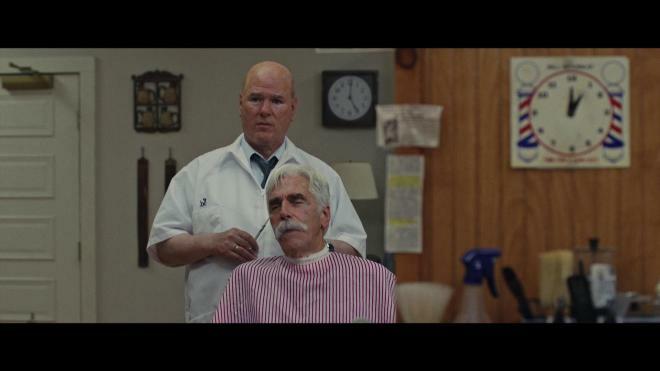 He occasionally sees his little brother Ed (Larry Miller) who works as the town barber. As he faces fewer and fewer days, he often remembers his younger self (Aiden Turner) and his time in the war. He only ever killed one man during the entire war, and it haunts him to this day. He doesn't like to kill - but it's the only thing he was ever good at. 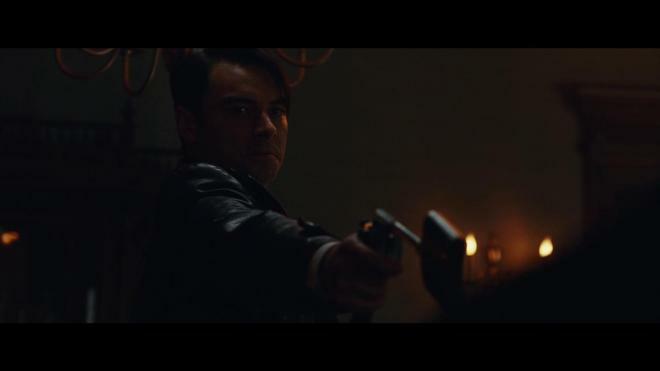 That's why an FBI agent (Ron Livingston) has come to town to recruit his services once more - to kill Big Foot. Only Calvin can stalk and kill this mysterious and lethal creature that's spreading a potential world-ending plague because he's the man who killed Adolph Hitler. At its core, The Man Who Killed Hitler and Then The Big Foot isn't an action movie or a cheesy exploitation flick like Billy the Kid Versus Dracula. It's a movie about a man facing his few remaining years with a life filled with regrets. His most heroic action was shadowing Nazi movements deep behind enemy lines, stalking a single target and killing Hitler. It was the first time he'd ever killed anyone. Because his actions didn't end the war as intended, the act was ultimately meaningless. It cost him a piece of his soul while the years he spent away from home caused him to lose Maxine (Caitlin FitzGerald) - the one and only woman he ever loved. When the Government seeks his help one last time, he doesn't want to kill again - but it may be the only chance for him to do something genuinely worthwhile. The Man Who Killed Hitler and Then The Big Foot is either going to work for you - or it isn't. There's very little grey area for a middling option. Written and directed by Robert D. Krzykowski, this film apparently took over 12 years to get made, and it kinda shows. The premise feels like the sort of film school goof my friends and I would have written and made, but was finally executed by an older individual with a sharper eye for emotional sentimentality. The best way I can give you an idea of what I'm talking about is to picture Chuck Jones making a deathly serious movie about an older, tired Elmer Fudd who finally killed that rascally rabbit but is compelled to pick up his shotgun one last time by Foghorn Leghorn to kill the violent rampaging Tasmanian Devil. There wouldn't be any humor, no levity of any kind. The only joke is that the film exists as an elaborate 97-minute prank - which is what I think this movie actually is. That is why The Man Who Killed Hitler and Then The Big Foot is difficult to review. There are times where it is absolutely brilliant, incredibly well directed, scripted, and Elliott delivers an intensely emotional performance. But then he has to go kill Big Foot in the last third of the film and this is the point where the film will possibly lose you. Had it been a story just about a man feeling guilty about killing Adolph Hitler and the toll it cost his life, that would be one hell of an incredible film. Had it just been a silly exploitation movie about a man who doesn't want to kill again - but it's the only thing he's good at and has to kill Big Foot, that would have worked too in its own unique way. It's when both films try to be the same picture at the same time that it becomes problematic. For myself, I'm of a middling opinion. If you dissect the film into individual pieces, everything works and I love it. But when you put the puzzle together the image doesn't quite come to a front. The tone of the film changes on a pretty sharp left turn and I didn't quite get thrown off the ride altogether, but I didn't fully enjoy it either. 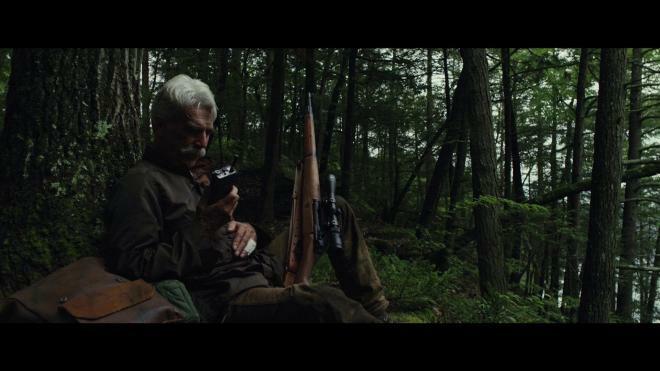 That said, if you're up for seeing Sam Elliott deliver yet another amazing performance in a completely ridiculous movie The Man Who Killed Hitler and Then The Big Foot should hold you over. The Man Who Killed Hitler and Then The Big Foot stomps its way onto Blu-ray courtesy of RLJE Films. Pressed onto a Region A BD-50 disc, the disc is housed in a standard sturdy snapper case with identical slipcover artwork. The inside art is reversible showcasing the alternate poster artwork. The disc loads to trailers for other RLJE releases before arriving at an animated main menu with traditional navigation options. I wasn't able to find any tech specs for the source of this 1080p 2.40:1 transfer, but I will say that the results are very impressive. The image boasts terrific details showcasing a wide variety of time periods and locations. Facial features, hairstyles, clothing, wild wilderness - all are up for close observation and this transfer holds its own beautifully. Colors are bright and robust and again, depending on the time period depicted showcase a terrific range of primaries. Black levels are equally impressive never getting too close to crush, allowing for the image to display a nice sense of natural depth. Whites are on point without any sign of blooming. The only iffy spots are some digitally inserted backgrounds late in the film where details lose some of that fine definition, but they're only brief moments and aren't all that distracting - just noticeable. All in all, this is a very good looking flick on Blu-ray. The Man Who Killed Hitler and Then The Big Foot arrives with a rock solid DTS-HD MA 5.1 audio track that doesn't disappoint. The opening sequence with young Calvin infiltrating a Nazi compound during an Allied bombing raid is particularly effective. It's a great blend of dialogue, sound effects, scoring, and atmospherics to create a tense and exciting scene. When the film needs to play things quieter and introspectively, it still works beautifully. As Calvin strolls around his home town with his dog, we're treated to a softer score and the easy-going sounds of small town living. During the action beats there are also some great LFE effects to give some extra punch when necessary. I would have loved to have heard an Atmos mix for this one, but just the same, this DTS-HD MA 5.1 track is a beast. Stuffed with a terrific audio commentary and a richly informative making-of feature, The Man Who Killed Hitler and Then The Big Foot comes packed with some genuinely worthwhile bonus features. 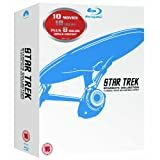 The audio commentary with Robert D. Krzykowski is solid material as the filmmaker offers up tons of scene-specific material without getting lost or just describing what's on screen. The making of feature is also a great in-depth watch that goes far beyond the typical talking-head EPK nonsense that so often passes for a bonus feature these days. If you're a fan you'll definitely want to pick through these. You may think you're getting what you expect with The Man Who Killed Hitler and Then The Big Foot, but I can safely promise you that you'll get something entirely different. I honestly didn't know what to expect, I went in as cold as possible without even seeing a trailer, and I was still left someplace in the middle. The title is the perfect description for the film and yet undersells its best attributes as a thoughtful exploration about love, loss, regret, and redemption. It's just a really weird film to explore those themes in! 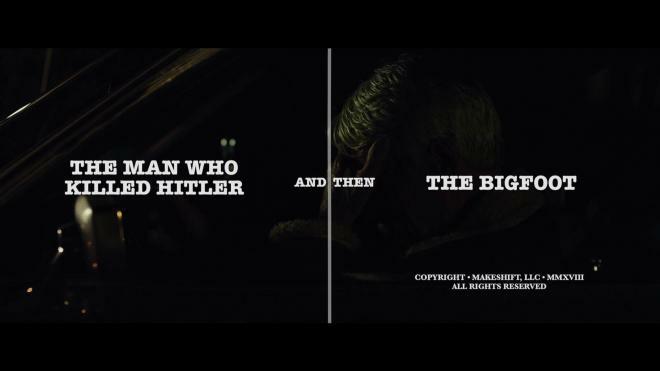 RLJE delivers a terrific Blu-ray release of The Man Who Killed Hitler and Then The Big Foot featuring an often striking image transfer, a fantastic audio mix, as well as a bunch of lengthy and worthwhile bonus features. It's because you'll just have to see it for yourself to believe it that I'm calling this one Recommended. 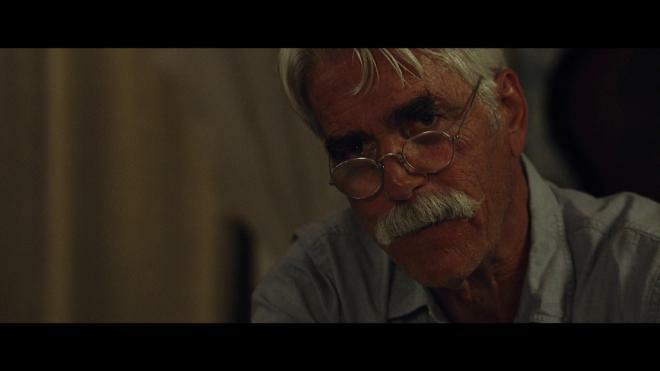 Sam Elliott is worth the price of admission alone - if even for a single viewing.